July’s “coming attractions” at True Classics. Another month has come and gone–a good month, all things considered (despite the drama that went down in the middle of June concerning a self-important, unnamed movie blog organization … bygones). And we have even more good stuff on tap for July! First, if you visit the site regularly, you may have noticed a change in address. We decided it was about time put on our “big girl” blogging pants and purchase our own domain. So now you can find us at trueclassics.net! If you also follow us on an RSS feed, you may need to change your settings to reflect the new address so the posts will continue to be delivered to you. During the second week of this month, Carrie, Sarah, and I will be posting pieces for the Best Hitchcock Movies (That Hitchcock Never Made) blogathon … which, around these parts, we have been referring to as the “Not-Hitch” Blogathon because, well, we’re lazy like that. As we’ve mentioned before, this blogathon, hosted by longtime TC friends Dorian (Tales of the Easily Distracted) and Becky (ClassicBecky’s Brain Food), celebrates the Hitchcockian flair of films that were not helmed by the “Master of Suspense” himself, but show definite influences of his inimitable style. There is a long list of contributors (with some very familiar names) already signed up to participate, so make sure to check the list daily as posts start going live next week. As for us, Sarah’s up first with Gaslight (1944) on Monday; I’ll follow with Sorry, Wrong Number (1948) on Tuesday; and Carrie will put Mel Brooks on the Therapy Thursdays couch with High Anxiety (1977) two days later. A number of other blogathons are on tap for the upcoming months. In addition to the CMBA Gene Kelly tribute next month, we have also signed on to contribute a piece to Angela’s Paramount Centennial Blogathon at The Hollywood Revue, which kicks off in September. This event will celebrate the 100th anniversary of Paramount, which the studio has been celebrating this year, and quite a few folks–including a number of classic movie bloggers–have signed up to participate. There has been a bit of an outcry among some film fans that the Paramount celebration has largely leaned toward recognizing more recent films from the studio’s storied past, so it will be nice to see some attention paid to some of the lesser-known (i.e. older) films produced by Paramount as well. Several other blogathons have been announced which, due to time constraints, we will not be participating in, but are worth mentioning here: Rianna of Frankly, My Dear and In the Mood’s Natalie are co-hosting The Great Recasting Blogathon this month–you can find information about it here; Kristen of Journeys in Classic Film is hosting the Universal Backlot Blogathon in September–you can find information about that one here; and information about Monty’s ongoing Cinematic World Tour at All Good Things can be found here. Finally, last month I was selected (along with Lara of the great blog Backlots) to serve on the CMBA Board of Governors for the next three years. I’m very glad to serve alongside fellow governors (and fantastic bloggers) Jessica of Comet Over Hollywood, Becky of the aforementioned ClassicBecky’s Brain Food, and board chairman Rick, the head barista over at the Classic Film and TV Cafe. 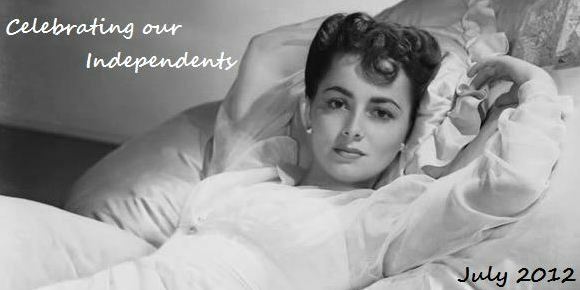 Here’s hoping the next few years see more growth and participation in our lovely community of classic film folks! I like blogging in June; how ’bout you? So much fun packed in one compact blog post! Beaucoup thanks, Brandie, for helping to spread the good word about our BEST HITCHCOCK MOVIES (THAT HITCHCOCK NEVER MADE) Blogathon! We actually ended up making our Blogathon a week long instead of 6 days, by popular demand! 🙂 Becky and I really appreciate your participation and ballyhoo, and we hope everyone will enjoy it! 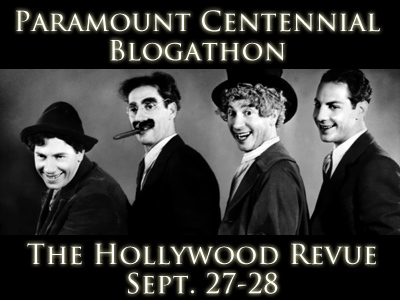 Looking forward to all the great upcoming Blogathons coming soon, including the CMBA Gene Kelly Blogathon, Kristen’s Backlots Blogathon’ Frankly My Dear, and so much more! Wow – what a whirlwind! Thanks for posting this and all the tidbits you’ve included. 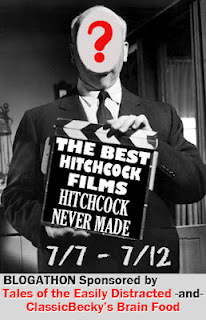 Looking forward to the “Best Hitchcock Movies (That Hitchcock Never Made) Blogathon!